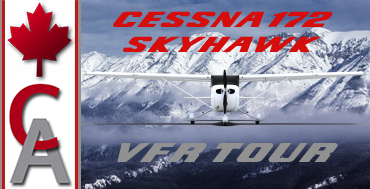 Description: Join us on our Cessna 172 Skyhawk VFR Tour as we fly "low and slow" so we can enjoy the scenery! 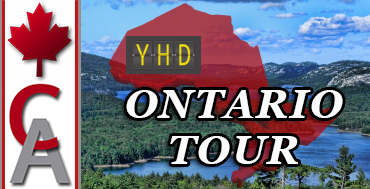 Description: Canada Air Virtual's YHD Ontario Tour has us departing from Dryden Regional Airport, flying the DHC6 Twin Otter to some very challenging airstrips though-out Western Ontario. Aircraft Substitutions: Propeller or Heli only! Description: The Santa Fe Trail was a 19th-century transportation route through central North America that connected Independence, Missouri with Santa Fe, New Mexico. Pioneered in 1821 by William Becknell, it served as a vital commercial highway until the introduction of the railroad to Santa Fe in 1880. Santa Fe was near the end of the El Camino Real de Tierra Adentro which carried trade from Mexico City. A highway route that roughly follows the trail's path through the entire length of Kansas, the southeast corner of Colorado and northern New Mexico has been designated as the Santa Fe Trail National Scenic Byway. 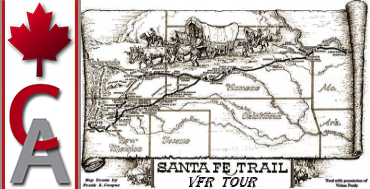 On the Santa Fe Trail VFR Tour your flights will take you through the states of Missouri, Kansas, Oklahoma, Texas, New Mexico, and Colorado. Description: Join Canada Air Virtual on our "Bug Smasher Tour" for a little Bush flying in our twin otter or your favorite bug smasher bush plane. 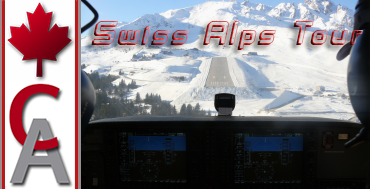 Description: Join us as we tour the Swiss Alps and scenic Switzerland with some mountain flights on our Swiss Alps Tour. Experience landing at Courchevel Airports very short runway of only 1,762 ft and a gradient of 18.6%. There is no go-around procedure for landings at Courchevel, due to the surrounding mountainous terrain. The runway has no instrument approach procedure or lighting aids, thus making landing in fog and low clouds unsafe and almost impossible. Description: The Brooks Range is a mountain range in far northern North America stretching some 700 miles from west to east across northern Alaska into Canada's Yukon Territory. Reaching an elevation exceeding 9,000 ft the range is believed to be approximately 126 million years old. While the range is mostly uninhabited, the Dalton Highway and Trans-Alaska Pipeline System run through the Atigun Pass on their way to the oil fields at Prudhoe Bay on Alaska's North Slope. 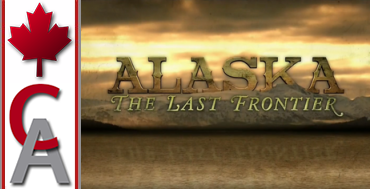 The Alaska Native villages of Anaktuvuk and Arctic Village, as well as the very small communities of Coldfoot, Wiseman, Bettles, and Chandalar Lake, are the range's only settlements. In the far west, near the Wulik River in the De Long Mountains is the Red Dog mine, largest zinc mine in the world. 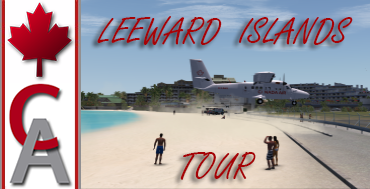 Description: Join us for this 12 leg hop around the Caribbean's Leeward Islands. Three of the islands airports should be familiar to many flight simmers. Princess Juliana International Airport where we will pass-over the crowded Maho Beach at low altitude just seconds before touchdown at runway 09. Saint Barth Airport for the difficult runway 10 landing. First we must pass a hillside close to the runway threshold, then we will have only 2400 ft of runway for braking with water on the opposite threshold. Last but not least Juancho E. Yrausquin Airport. Saba has a 1300 ft short runway which is claimed to be the world's shortest runway for commercial flights. At both runway thresholds there are cliffs dropping into the sea. If you've ever wanted to try an aircraft carrier takeoff this would be the place! 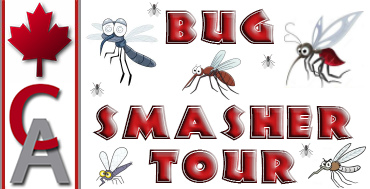 Description: Sign up for our "Tour Alberta" tour. We'll fly from Villeneuve Airport, located north west of Edmonton, making our way to our final destination of Medicine Hat Airport, located in the south eastern corner of the province. 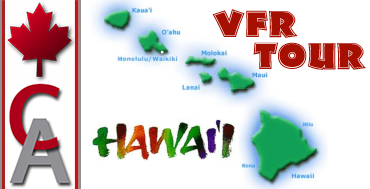 Fly VFR in the Cessna 172 or your favorite prop aircraft. Description: The South West B.C. 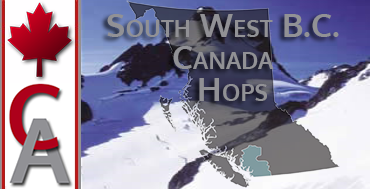 Canada Hops Tour has us visiting some very interesting and challenging location. 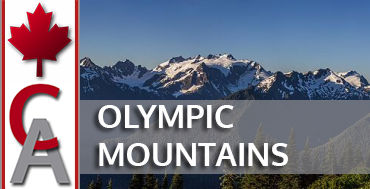 If you enjoy flying VFR in the beautifully scenic and breathtaking mountains of British Columbia, then this is a tour you don't want to miss! Grab your favorite piston pounder and join Canada Air as we fly 30 intimidating atolls approaches on our "Tuamotu Islands Tour"
The Tuamotu Islands are a French Polynesian chain of almost 80 islands and atolls forming the largest chain of atolls in the world. Pilots may land at the nearest airport or on the grass/field nearby! 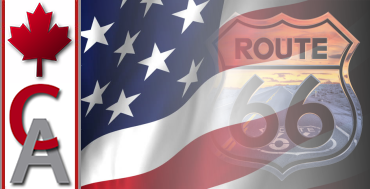 Description: Join Canada Air as we fly U.S. Route 66 from Chicago to Santa Monica along the "Main Street of America" one of the most famous roads in the United States. 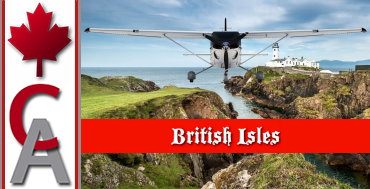 Join us on our British Isles tour as we fly VFR to various destinations of the British Isles. 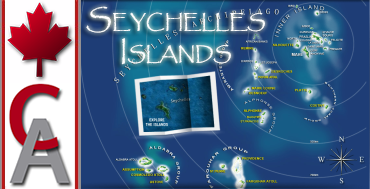 Join Canada Air on this thrilling VFR adventure as we explore the Seychelles Islands in the Indian Ocean, off East Africa. There is no downloadable scenery to solve this issue. 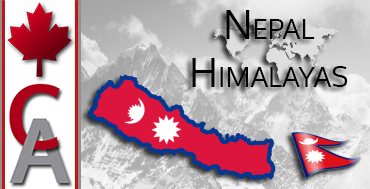 Description: The diversity of the terrain in this tour is stunning and majestic to fly over. 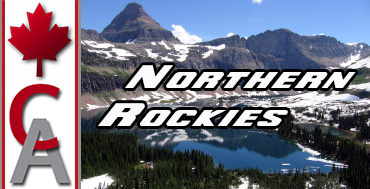 Use the roads, rivers, lakes, power-lines and vertical obstructions for accurate VFR flying. 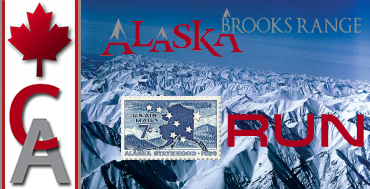 Description: The breathtaking beauty of Alaska sometimes hides the fact its winters can be incredibly harsh, especially for those who live in the state's outlying areas. Join us as we fly off the grid, where running water and electricity aren't daily staples, nor is contact with the outside world. This will prove to be a challenging tour, as it will be very easy to land at the wrong airport at several locations, so double check before landing. 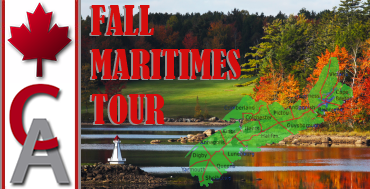 Pilot's are welcome to fly their favorite propeller aircraft on the tour!